I am so happy to introduce y’all to a wonderful friend of mine today! Chelsey and I became friends through a network of bloggers and instantly felt like we had known each other for years. Don’t you love it when God puts those kind of people in your life? I know you will enjoy her just as I do. Welcome Chelsey Coffee! When someone asks me to wait for something, I squirm worse than my five-year old son. I have specifically instructed my husband never to tell me he has a surprise for me and then make me wait. It is one of the most maddening experiences in the entire world for me. Oftentimes, God makes me squirm. Last year, I was in a difficult situation with my job. The pressure I felt was immense. My co-workers were busy working 50+ hours a week, while I was trying to get the same amount done in 40 hours so I could be home with my family. Something had to change. I started applying for new jobs. I even applied for jobs I was overqualified for and would probably wouldn’t give me enough hours. At one point, it was even looking like I would get a job I had always wanted. But that door closed as well. I felt like I was drowning and began to squirm. I prayed about it constantly. And yet, rejection letter after rejection letter came in the mail in response to my applications. I felt like God wasn’t listening to me. I cried to my husband and he encouraged me to have faith God was doing something with this situation. “Wait patiently for the Lord. Be brave and courageous. Yes, wait patiently for the Lord.” Psalm 27:14. So while I was waiting, I kept working. My employer started to give me some new responsibilities, and I worked hard at them. I had faith God would eventually answer my prayers and either change my attitude, or show me something new. Then a call came in. An employer kept my application from one of the jobs I applied for in which I was overqualified. The human resource specialist indicated they had a new job opening they had just created that better fit my expertise and it was full-time. When I interviewed for the job one of the questions I was asked was if I had any experience with something specific. The interesting thing is, I recently received that experience while waiting for a new job. Remember those additional responsibilities I spoke about? They helped land me the job. And this job has been amazing. It is close to home, offers the flexibility I need, and kicks me out at 5:00 to go spend time with my family. 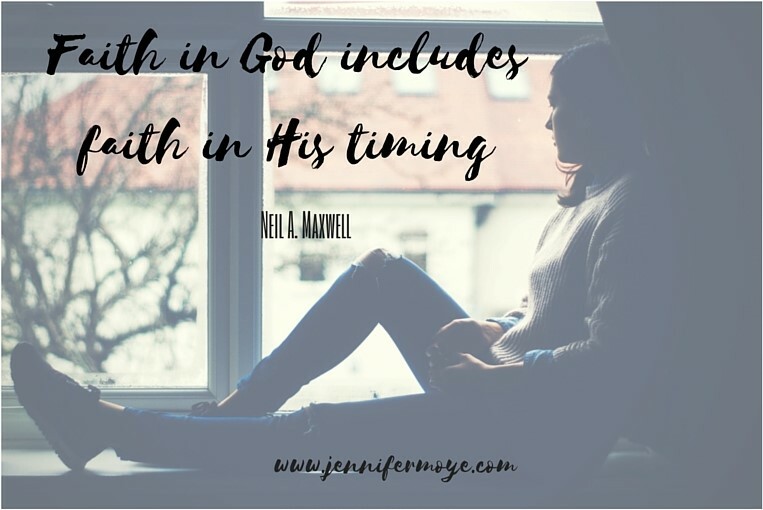 Lean on the Lord – During this time of waiting it is so important to stay close to God. He is the only one who can offer us peace during the unknown period. Continue to Grow – What can you do during this time to help you grow? For me, it was taking on some extra responsibilities. Maybe for you it’s continued spiritual growth or additional learning. Become Who You Need to Be – When I talk to women who are in a waiting period to find a spouse, I tell them to become the kind of woman they want to have in a spouse. If they are interested in someone who is spiritually mature and has a healthy lifestyle – they better look in the mirror first and make sure they are living up to that expectation. Don’t Give God a Time Limit – How long are you going to wait on the Lord? So many people I know only give God a certain period of time before they take matters into their own hands. I’ve been guilty of it before. Maybe the day after you give up, was the day God was going to bless you. Take the story from 1 Samuel 13, where King Saul is instructed to wait for Samuel to perform the burnt offering to the Lord. King Saul becomes impatient when Samuel doesn’t show up so takes matters into his own hands, disobeys the Lord, and performs the burnt offering. Moments later, Samuel shows up. “’My thoughts are nothing like your thoughts,’ says the LORD. ‘And my ways are far beyond anything you could imagine.’” Isaiah 55:8. I am so thankful that Jen let me be here today. I am a Christ-Follower, wife to Wade, mom to Jude (5), and stepmom to Cavan (16) and Remy (8). I love reading, writing and ministry. My husband and I are currently in the process of starting a church plant. I would love to connect to you at my blog: chelseycoffey.com, Facebook: facebook.com/chelcoffeypage, or via Twitter twitter.com/chelcoffey. I hope you have a blessed day! A really encouraging post, Chelsey. I love your number 3. It speaks to me in a different way. I’m married to an unbeliever…this is my most heartwrenching waiting right now. Love how so many things I’ve read and had come to me (while out and about) are on all things being made beautiful in God’s timing. Thank you, Jesus, for encouraging me through Chelsey! Anna, praying for you and your husband right now. Thank you for sharing. Love this! Number 4 is what I am working on right now. In my relationships, our house situation, the work He is doing in me…ehhh! Thanks for sharing this nd giving the scripture with it – the Saul example is eye opening. God bless you and thank you Jen!